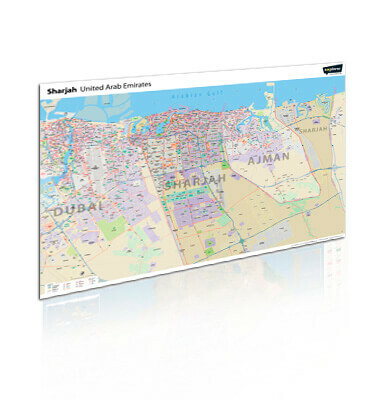 Produced by our highly skilled team of cartographers and designers, this useful large wall map shows the whole of Sharjah and beyond in detail, covering all the major road networks and more. This easy-to-use map is also aesthetically designed making it the perfect wall hanging for the office, school or home. This product is available in a variety of standard sizes and finishes. Contact us on +971 (0)4 340 8805 for bulk discounts and to see the full range of options to customise your own wall map, including size, scale, format, framing, points of interest, branding and languages.